He was 36, her art teacher, and a dashing provocateur of the strict German art establishment in 1902. She was 25, a liberated woman and one of the few females who dared to be an artist. Together with a select group of Germans and Russians, they founded the rebellious cadre of artists known as “Blue Rider.” This group of maverick artists began the Expressionist movement in Germany. Vassily Kandinsky and Gabriele Münter, teacher and student, began a passionate love affair. Obstacle: Kandinsky was married, his estranged wife in Russia. After he promised to divorce his wife and marry Münter, the couple lived and worked together for 10 years, bringing out the highest creativity in each other. Kandinsky’s Russian divorce was not granted. WWI began. 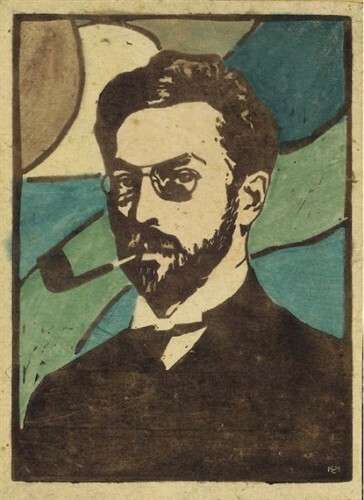 Kandinsky was compelled to return to Russia. Münter, remaining in Germany, promised to safeguard hundreds of his and other “Blue Rider” paintings in their house near Munich until he returned. Kandinsky finally obtained a divorce in Moscow. Without telling Münter, at 51 years of age he married a 24-year-old woman named Nina. Münter, upon discovering the secret marriage, refused to return Kandinsky’s paintings. He never saw these paintings again. Abandoned she may have felt, but Gabriele Münter kept her promise! For 30 years she sheltered Kandinsky’s work. In the dark years of fascism, when Hitler outlawed “degenerate” art, Münter hid the paintings in the basement of her house. In spite of several house searches by the Nazis, the cache of art was not discovered. After the war, Münter once again kept the paintings hidden. This time from the Russians, who were “expatriating” art for The Hermitage, their state museum. On her 80th birthday, in 1957, Gabriele Münter gave the art world her greatest gift. She donated the incredible treasure trove of over 1,000 “Blue Rider” works to the Munich Municipal Museum. 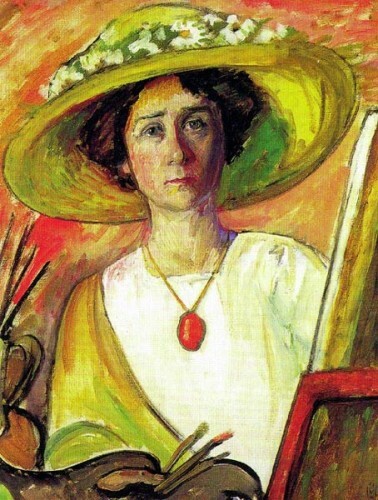 Gabriele Münter is considered the savior of early German Expressionism. Unrequited love. Her loss, but our immeasurable gain . Thank you for sharing, Kirby. It was a pleasure to hear from you, Lou! Very cool story and work too. NYSS was big on those large forms in German Expressionism, right, Jim? I like her work better than his — so there! And how are you doing, my friend? I’m falling off my chair laughing at your comment, Ann! Love it! Ah the irony! That Hitler, a failed artist, should outlaw “degenerate” art and then be outfoxed by Munter and Kandinsky. Thanks, Stuart for the reminder of what art is all about. Interesting to ponder what that truth and beauty is in the art world today! Münter could not paint for years after Kandinsky left her, until she met Johannes Eichner. Kandinsky’s and other Blaue Reiter paintings can now be seen in the Lenbach Haus in Munich. thanks Cornelia for more info on Munter and her life. I have to edit so much of my research that I have to omit very interesting details. Your comments are much appreciated! I love these, Kirby. Thank you for doing this! Thank you, John. It gives me such pleasure to know you enjoy my art blog! It is good to hear from you, Beverly! I am honored that you read my art blogs and would love to hear any comments you have about the art. Great Blog! I love learning about the artists and art you write about. It is a pleasure to write about art, Katy. Thank you for your comments. Wow! Sooo interesting! I should have known all that. Years ago when I was studying art, there was little or nothing told about her art. It was only later that I learned more about her. Sissy & I wanted to go see her house while we were in that area. I can’t remember, but I think we just didn’t have the time to do it. Now, of course, I so wish we could have. What a hero she was. 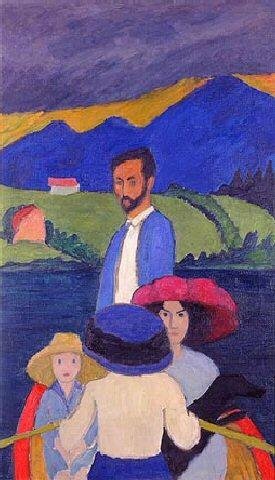 Yes, Margo, in a lot of my research of the Blue Riders, Gabriele Munter wasn’t even mentioned. Hard to believe! Thanks for commenting as I am sure most of us had no idea how important she was to German art. Thank goodness (not Kandinsky) that she was able to save these paintings. This was a gift to the German people of astounding proportions. Wouldn’t it be great to see all those Blue Rider paintings in one place…the Munich museum! Thanks for commenting, Sissy. I forgot to say thank you Kirby for this information. I thought I knew quite alot about both of them but I was wrong. Ahh, those wild & crazy artists! What a story! Thank you for sharing it. All I know about the German Expressionists I learned from Kirby Kendrick. Thanks, Kirby, for opening up a new world of art to us. I have a good mentor….LB! Another masterful blog Kirby, thank you. I am a Gabriele Munter (need an umlaut for the u) fan of the first degree. Wish she could join us for lunch someday. One of your best blog posts to date, Kirby. BRAVA! I feel like you are really getting to the heart of the narrative you want to unearth in the history of art. I wish I could go back in time and be a fly on the wall!! Thanks for sharing this information! Gabriele Munter made the right decision in her time, didn’t she! Thanks Ina! It is a real learning experience. Now THAT is a sad story. 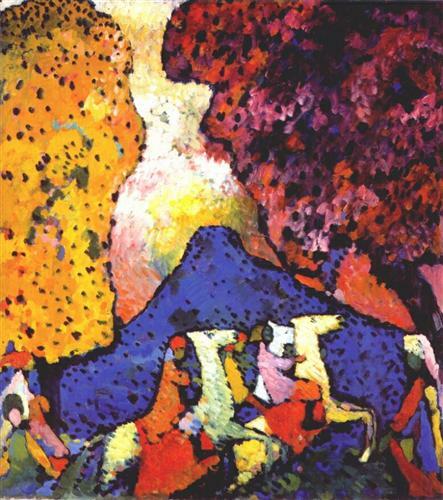 In light of the fact Perfidious Kandinsky married a girl less than half his age, once he received his divorce, it is truly amazing ( and fortuitous for us) that Munter was able to save the Blue Rider paintings. I must confess that I am a bit pleased that Munter saw to it that Kandinsky never saw his precious paintings again. To paraphrase an erstwhile Presidential wannabe (Goldwater), “Vindictiveness in the face of perfidy is no vice”. Wow, David. What a quote from Goldwater. I’m not sure I buy that one, tho. Kirby, I love your blog! I enjoyed reading about Kandinsky today; I didn’t know that story. They always go for the young “trophy” wife, don’t they? Glad that his ex-mistress kept the work safe. Serves him right!! Love the Boat painting! Romantic story! Thanks for that. Great blog – new info for me! Thanks for educating me more about art! Those older men and their young women – shame on him!!!! I’m sure it broke her heart!!! thanks so much for the bio, kirby. clearly, miss munter was attractive, talented, and very very brave. you could even call her a one woman “monuments men.” good for her! So interesting, Kirby, when the “scorned” woman’s emotions crossed over from love to revenge. Naively, so many think such a change is impossible, while caught up in the intense emotions associated with an affair. Wow! What an interesting story. I am so happy to have found your blog and I’ll be reading the archives. Nothing more entertaining to me than art talk! Great story and so well described. Love, passion, betrayal, life interfering with living. All of this combined with international intrigue, war, and finally vindication. He was a cad but the paintings are wonderful. Love, passion, infidelity, political intrigue, war, brilliant art – what else can one want? So well described, illustrated. Great. Once again, my education of the wonders of art is heightened. Thank you Kirby. I even conquered the CAPTHA CODE! Good to know. I like your blog. Not just a wonderful artist but also a wonderful art patron and protector. Thanks!